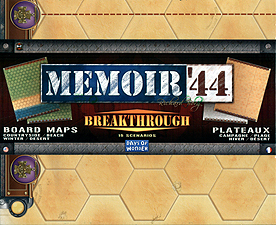 Add depth to your game with the definitive Memoir '44 Breakthrough kit! Two supersized 2-sided, 9-panel, hard-mounted Breakthrough board maps featuring countryside, beach, winter and desert battlefields that measure an impressive 13 x 17 hexes deep! Includes 15 Breakthrough scenarios, with such classics as Operation Crusader, Operation Amherst, and two different renditions of the battle for Sword Beach. This expansion is not a stand-alone game and requires a complete copy of Memoir '44 - and various expansions, depending on the scenario being played - to be enjoyed.